Detroit, 11 January, 2016 –The Audi h-tron quattro concept car offers a preview of what future mobility could look like. It offers excellent range, swift refuelling and sporty road performance, combining a highly efficient fuel cell with a powerful battery that can provide a temporary boost of 100 kW. The car can be fully refuelled with hydrogen in around four minutes, and is then ready to drive for up to 600 kilometres. The technology study also provides a glimpse of things to come in the fields of piloted driving and piloted parking technology. Audi will go into production with this technology in 2017, with the next generation of the A8 luxury sedan. The Audi h-tron quattro concept is another milestone along the path towards future mobility. Whether with purely battery-powered drive, plug-in hybrid, combustion engine or fuel cell – Audi has a command of all alternative drive technologies and offers tailor made solutions for its customers worldwide. 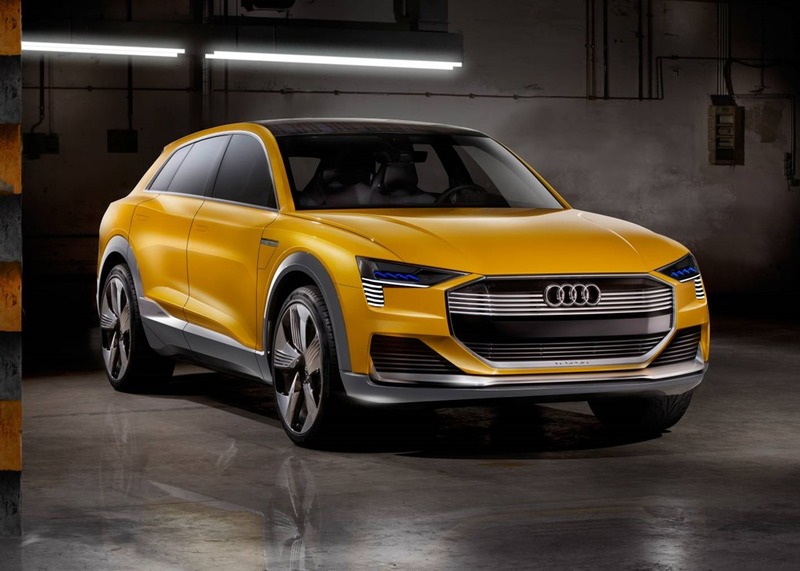 The Audi h-tron quattro concept is closely related to the concept car Audi e-tron quattro concept. This latter concept car of a purely electric-drive SUV was first showcased by the brand with the four rings at the 2015 Frankfurt Motor Show. Both are based on the second-generation modular longitudinal platform (MLB evo). This concept is especially flexible. For example, both cars use a virtually identical floor assembly despite their different technology. 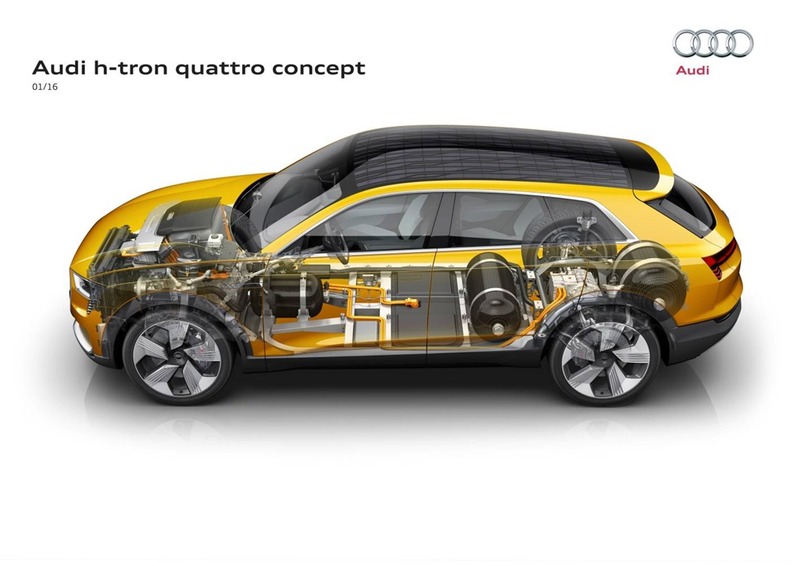 The Audi h-tron quattro concept presents the fifth generation of fuel cell technology from Audi and Volkswagen. Lighter materials reduce the weight and improve performance, responsiveness, service life and efficiency. With an efficiency rating in excess of 60 percent, the fuel cell now surpasses any combustion engine. The ‘stack’ comprising 330 individual cells is housed in the forward structure. The three hydrogen tanks are located beneath the passenger compartment or luggage compartment but do not impinge on the interior. At a pressure of 700 bar, they store enough hydrogen for a range of up to 600 kilometres. Every tank is made up of several layers – the inner tank from gas-tight polyamide is wrapped in carbon fibre reinforced polymer (CFRP) and fibre glass reinforced polymer (FGRP). Like a car with combustion engine, refuelling takes about four minutes. Ideally complementing the fuel cell that develops up to 110 kW, there is a compact lithium-ion battery designed for optimum power output. The battery, weighing less than 60 kilograms, is located beneath the passenger compartment to optimise the centre of gravity. It supplies up to 100 kW of power, ample for a temporary, forceful burst when accelerating. When the car is braked it stores the recovered energy. With 550 Nm of system torque, the Audi h-tron quattro accelerates from 0 to 100 km/h in less than seven seconds; its top speed is governed at 200 km/h. The power from the fuel cell and the high-voltage battery drives two electric motors – one located on the front axle and with an output of 90 kW, the other on the rear axle and developing 140 kW. This concept makes the technology study an electrified quattro. An intelligent management system controls the interplay between them as appropriate for the situation, placing maximum emphasis on efficiency. A heat pump for the interior air conditioning and a large solar roof that generates up to 320 watts, equivalent to adding up to 1,000 kilometres to the range annually, also boost efficiency. According to the New European Driving Cycle its fuel consumption is around one kilogram of hydrogen per 100 kilometres. The Audi h-tron quattro concept achieves not merely zero local emissions, but zero global emissions if the hydrogen it runs on has been produced with green power. The brand with the four rings realises this at the Audi e-gas facility in North Germany. Since 2013, the world’s first power-to-gas plant has been using electricity generated by wind power to break water down into oxygen and hydrogen by electrolysis. In a further process, this gas is currently reacted with CO2 to produce Audi e-gas, or synthetic methane, for the Audi A3 g-tron and the A4 g-tron with CNG drive. Many customers are already using the e-gas fuel card to buy Audi e-gas via the existing natural gas network at conventional CNG filling stations, enabling them to drive almost CO2-neutrally. But in future it will be possible to tap this hydrogen source so that fuel cell cars can run on this climate-friendly fuel. Through the concept car h-tron quattro concept, Audi demonstrates just how emotion-packed piloted driving can be. It comes equipped with all the technologies that the brand has developed for piloted driving – radar sensors, a new kind of video camera, ultrasonic sensors and a laser scanner. The driver assistance systems are now usually managed by spatially separate control units. In future, Audi will be implementing this function in a central domain architecture: all available sensor information is processed by a central driver assistance system (zFAS). It computes a complete model of the car’s surroundings in real time and makes this information available to the assistance systems and the piloted driving systems. They can assume driving tasks during parking or in stop-and-go traffic on freeways at speeds of up to 60 km/h. Audi has been performing pioneering work in this domain for many years and in 2017 will be taking this technology into production for the first time ever with the next generation of its Audi A8 full-size sedan. The exterior design of the five-door technology study blends aesthetic appeal with aerodynamics. The Audi h-tron quattro concept is 4.88 metres long and 1.93 metres wide but just 1.54 metres high. Its silhouette with the extremely flat greenhouse that tapers strongly toward the rear lends it the dynamic character of a coupé. The flowing shoulder line forms distinctive blister contours above the wheels in an expression of the electrified quattro drive. Wide wheel panels and angular side sills underscore the robust character of the car. The Cd value of 0.27 makes a major contribution to maximising range and efficiency. Aerodynamic elements down the flanks, on the underbody and at the rear improve the way air flows around the car at higher speeds. Cameras take the place of exterior mirrors, further enhancing aerodynamics and efficiency. The headlights of the technology study are divided into two sections. The upper section generates the light using the new, extremely high-resolution Matrix laser technology. The lower section, which corresponds to the slats in the Singleframe grille, forms the lighting signature. In addition to the white daytime running lights signature, flat OLED (organic light emitting diode) elements radiate a homogeneous blue light to the sides and upwards. Beneath the lights there are two large air intake slots. The sills incorporate a light strip in Matrix LED technology which again emits white light when the driver approaches the technology study with the remote control key. When the car is driving in piloted mode, this is signalled by blue horizontal lines lit up down its sides. Mirroring the front configuration, the rear lights likewise consist of two elements. Each of the upper zones features nine red OLED units that handle the tail light function, with three more below. The package of the Audi h-tron quattro concept enables a spacious, comfortable interior for four persons and 500 litres of luggage. Intelligent software provides assistance when loading up: two small sensors scan the items of luggage and display the optimum loading order on a monitor mounted on the rear cutout. 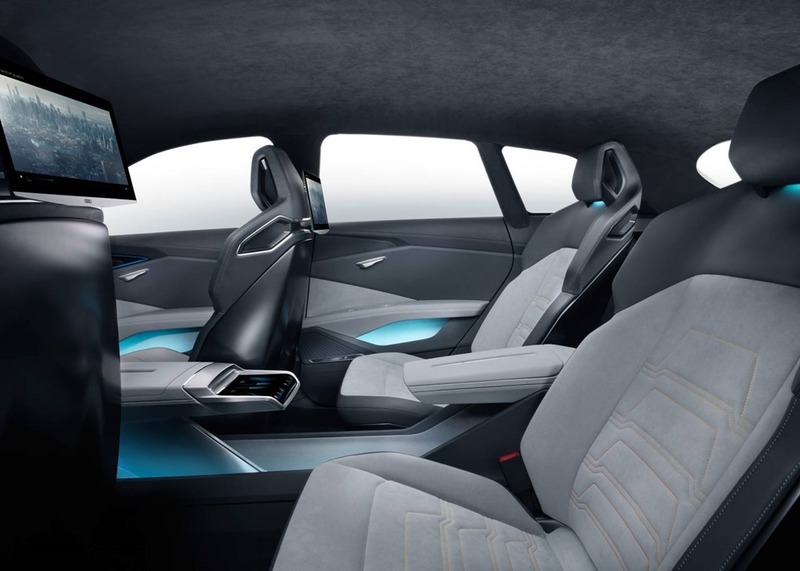 The interior of the Audi h-tron quattro concept has a light and open feel to it; its architecture merges harmoniously with the operating and display concept. The three large displays in front of the driver are designed using OLED technology – their wafer-thin films can take on virtually any shape. There are also two touch displays in addition to the central Audi virtual cockpit curved OLED. The driver controls the lights and the systems for piloted driving with the left one. The large display on the right is for managing media and navigation, and also displays the drive system’s operating statuses. The steering wheel serves as a further control level. Its spokes are equipped with contoured touch surfaces. The selector lever for the driving mode is mounted on the console of the centre tunnel. 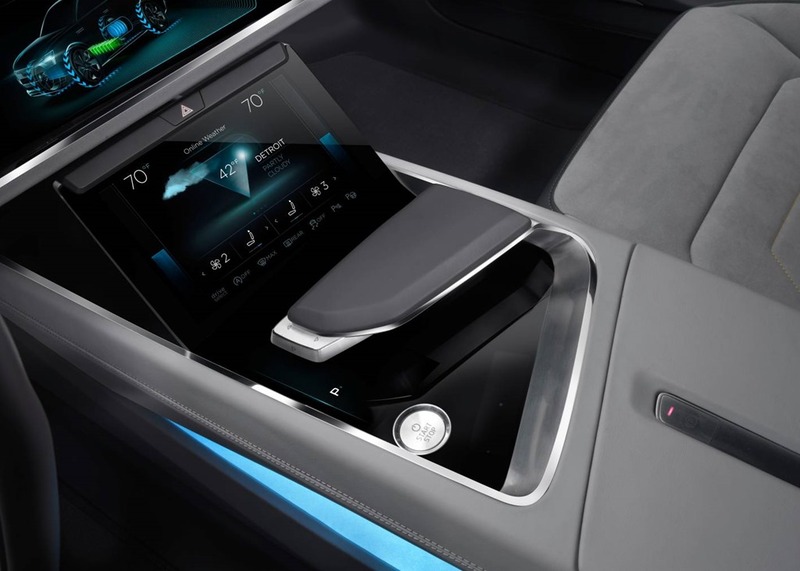 In front of it, there are two further OLED displays – for the drive status, the air conditioning and for freely programmable information functions. The front one offers gesture controls. The curved displays in the front section of the doors serve as digital exterior mirrors. The two rear passengers sit on comfortable individual seats. They can share data with the driver via the Audi tablets, which again have OLED displays. The tablets are designed as a mobile Rear Seat Entertainment system.